KARACHI: The State Bank of Pakistan says it will issue a Rs50 Sir Syed Ahmed Khan commemorative coin from October 17, the birth anniversary of the renowned Muslim scholar. Sir Syed Ahmed Khan was a renowned author, educationist and Muslim reformer of 19th Century, who laid the foundation of Muslim renaissance in Indo Pak sub-continent, which ultimately led to the creation of Pakistan in 1947. On 17th October 2017 the 200th birth anniversary of Sir Syed Ahmed Khan was celebrated. On this occasion, in order to recognize meritorious services rendered by Sir Syed Ahmed Khan towards the welfare of Muslims of South Asia, the Federal Government authorized the State Bank of Pakistan to issue Rs. 50 Commemorative Coins. These coins will be issued through the exchange counters of all the field offices of SBP Banking Services Corporation from October 17, 2018. The waxing crescent moon and five-pointed star facing North West in rising position is in the center. The periphery on the top of the crescent star is inscribed in the wording “ISLAMI JAMHORIA PAKISTAN” in Urdu script. Below the crescent and at the top of two springs of wheat with arms curved upward, there is the year of issuance 2017. 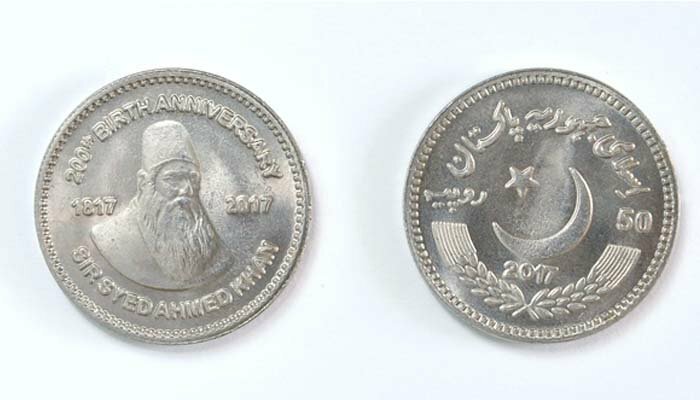 The face value of the coin in numeral “50” in bold letters and RUPIA in Urdu script are written on the right and left sides of the crescent star respectively. There is a side portrait of Sir Syed Ahmed Khan in the center. The wording Sir Syed Ahmed Khan is inscribed below the portrait. The life span 1817-2017 is inscribed in the left and right side of the portrait and the above the portrait 200th Birth Anniversary is inscribed along with the periphery of the coin.